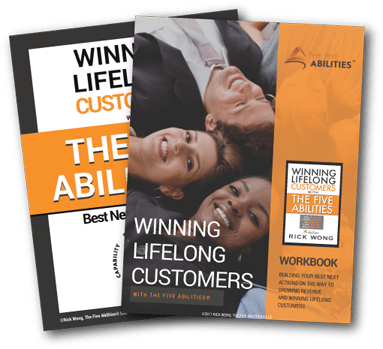 A sales pipeline is made up of segments that align with The Five Abilities®, each of which must be flowing for business to thrive. As with a water pipe, if any segment is plugged, the whole pipe ceases to flow. 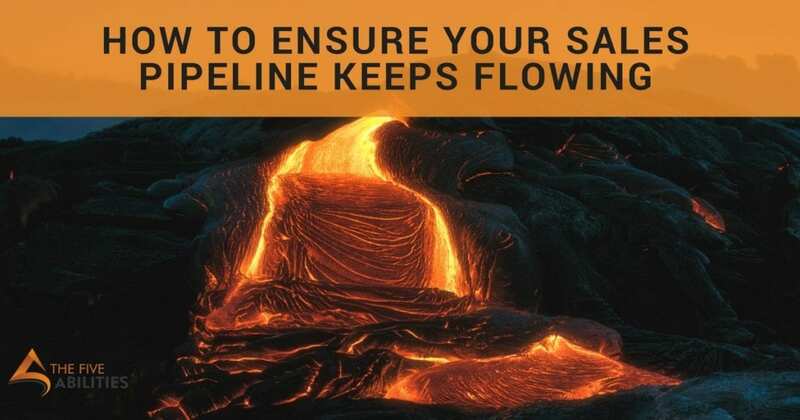 The question you must always tackle is how to ensure your sales pipeline keeps flowing, which requires solving the varied problems that can block each stage of the pipe. Let’s review the five segments and the role they play in closing a sale. Being visible means you’ve created a suspicion of value in the mind of the customer, such that they ask to learn more from you. They’re curious. This is accomplished with marketing along with sales activity targeted at the needs of each customer in the pipe. This is where most sellers are most adept meaning it doesn’t greatly differentiate you from you competitors. This only clears 10 percent of your pipeline. To earn credibility, you demonstrate expertise as it applies to the customer’s problems. You educate customers on ways to advance their business thus earning the opportunity to advise them. Web content and in-person sales exchanges are meant to clear this part of the pipe and all your competitors do this. This also clears 10 percent of your pipeline. You have a product or service that solves problems that your customer has. You present your offering with clear logic and you convince the customer that success is achievable. You offer a viable offering for the customer and the customer is ready to succeed with your offering. This is where you begin to separate from every other offer out there therefore clearing another 20 percent of the pipeline. Can you close now? Yes. If one or more of these things are true, you can close the sale with just 40 percent of the pipeline cleared. • Don’t care about repeat business – If your success doesn’t rely on loyal customers who will refer you to others—you can close now. In the world of ultra-competitive, high-value, enterprise selling, these three things rarely exist and yet many sellers get stuck here rather than clearing the critical final two segments that earn lifelong customers. No matter how good your offering, first to market and monopoly are short-lived, at best, and not welcomed, at worst. These rare situations often lead to complacency and they always bring strong competition making it hard to clear the way for ultra-profitable repeat business. Companies don’t make decisions, people do, and people make business decisions for personal reasons. The bigger the decision, the more personal it will be. The right decision is one that benefits the company and gives a personal win to the decision-maker. Increased profit leads to rewards for the decision-maker and key influencers. Smoother operations lead to greater simplicity for the customer’s team. New market share makes the decision-maker a change-agent. Help the customer earn that personal win and you’re on your way to winning a lifelong customer. Always expect the unexpected because this is when you shine. When your customer learns to rely on you no matter what, you’ve earned a lifelong customer. You’ve earned lifelong referrals and a friend no matter where their career takes them. Being visible, credible, and viable gets you invited to play. Delivering personal wins for your customer and getting them to rely on you in all circumstances earns you lifelong customers.